Gorilla hair mulch might sound like someone’s idea for recycling debris from the zoo’s primate exhibit, but it has no connection to actual gorillas. 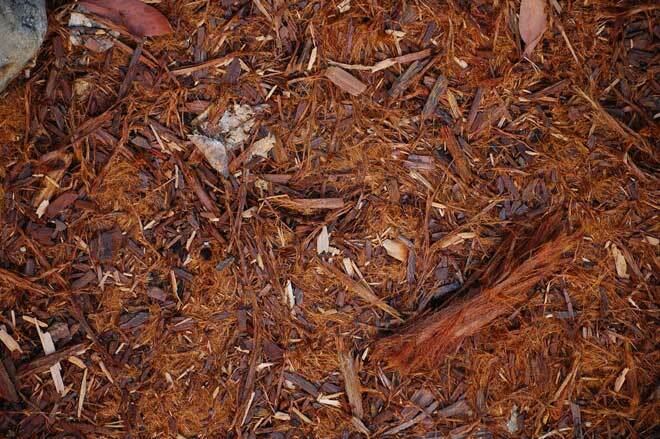 This plant-based mulch is made from redwood or red cedar bark finely shredded to resemble the thick hair of a gorilla. The bark used is a byproduct of lumber production that would otherwise go to waste, and as a natural, non-toxic material, it’s an environmentally friendly choice. Valued for its longevity and ability to stay where it’s put, gorilla hair mulch is popular for use on uneven ground and in well manicured, formal landscapes. Its unusual color and tendency to mat together means it’s not ideal for every style of garden or climate, though. Understanding the benefits and drawbacks of this common wood mulch will help you decide if it’s right for you. Gorilla hair mulch is one of the best choices for windy areas and slopes because it stays put better than small wood chips, straw, and other light material. As this mulch gradually breaks down, it forms a dense mat that won’t shift around in the wind or rain. As an added benefit, it also helps hold the soil in place, reducing soil runoff on low slopes. While it’s more stable than other wood mulches, before gorilla hair mulch mats, it can still blow around in locations with constant winds, such as near the seacoast, and gradually slide down very steep grades. Laying a jute mat on the soil before mulching helps the mulch mat faster, but it can also create fertile ground for weeds. If you’re dealing with a windy area or steep slope, consult a landscaper before you mulch. A mat of gorilla hair mulch keeps the soil cool and forms a barrier that slows down water evaporation. Its ability to protect your plants’ roots from the sun make this mulch a good choice for dry climates. It’s especially helpful if you use drip irrigation. On the downside, the mat this mulch forms can turn into a watertight barrier that prevents rainwater from reaching the soil surface. If you’re in a dry climate, you’ll need to periodically inspect the soil after it rains or water your garden to ensure enough water is finding its way through the mulch. Unlike coarser mulch, such as wood chips, a dense mat of gorilla hair mulch lets little light through, inhibiting the growth of weeds. In a wet climate, however, you might find weeds growing on top of the mulch. This problem is even more likely if you make the mistake of putting non-biodegradable landscaping fabric under the mulch. The natural oils in redwood and cedar bark deter plant-damaging insects, such as beetles, moths, and ants. With cedar gorilla hair, these oils also emit a distinct cedar scent most people find pleasant. What’s more, the texture is difficult for slugs and snails to navigate, so they’re less likely to reach your plants. As a coarse, fibrous material, gorilla hair mulch decomposes more slowly than finer mulches. Redwood and cedar also resist rot well. These properties combined give you a mulch that will stay on your garden longer than other types of wood-based mulches. Although the color will fade, this mulch performs well for three or four years, depending on your climate. That means less mulching work for you. Its durability is one big reason gorilla hair mulch is popular for use around commercial properties. Your plants also benefit from the relatively slow release of nitrogen and other nutrients. Because the mulch stays in place as it decomposes, it will also hold valuable nutrients in the soil, keeping them from washing away in the rain. On the other hand, because it provides nutrients so slowly, it’s not as effective for use as a supplemental fertilizer as grass clippings, leaf compost, and other rapidly decomposing mulches. The mulch works well in garden beds with shrubs and larger perennial plants. For an annual bed, it’s less than ideal. Gorilla hair mulch won’t break down for several years, so you’ll need to move it aside to replant the bed each year. The rich color and fluffy texture of gorilla hair mulch make it an eye-catching addition to the garden. It’s available in both natural light brownish-red and naturally dyed black varieties, so you can choose a color that either blends in with your local soil or contrasts with it, depending on your preference. Not everyone is a fan of this mulch’s looks, though. Some find the color too unnatural and conspicuous. Because gorilla hair mulch is so often used around office buildings and businesses, it can give a home something of a cold, commercial feel. Although gorilla hair mulch is natural and non-toxic, it can pose a choking hazard to dogs, small livestock such as goats, and other animals that might chew on the fibers. If you have a curious dog that likes to chew, you’ll be better off with something other than gorilla hair mulch, such as leaf compost or very finely shredded cedar. If gorilla hair mulch sounds like something your garden beds could benefit from, late spring or early autumn are the best times to get started. Apply a layer of 2 to 3 inches, or up to 4 inches to prevent soil compaction in areas with high foot traffic. Leave 3 inches of open ground around your plants to let air reach the stems. Once the mulch begins to mat, occasionally inspect the soil under it to be sure it’s getting enough water and not harboring weeds. With its ability to stay put, gorilla hair mulch is the perfect solution for landscaping a slope or a wind-blown garden bed. Its longevity also makes it a smart choice if you’d rather not apply new mulch every year. If you’re looking for something that blends in or breaks down fast, though, this isn’t the best mulch for you.